On Friday my daughter was outside and she saw this beautiful butterfly in our yard. She asked me to hurry and grab my camera in hopes of getting a picture of it. Don't mind the brown grass, it's been so dry here and we've hardly had any rain for the past month. Good thing we finally got some rain yesterday. 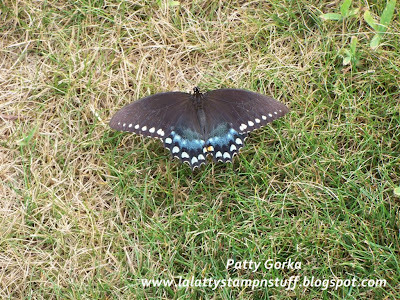 The card I made for today was totally inspired by this butterfly, btw- isn't it really pretty? My card also follows this week's CAS, Clean & Simple Sketch challenge based on Emily's card found here. I stamped and colored the butterfly image using my SU markers. I used my white gel pen to highlight a little bit of the wings and once I was finished I decided to add some DD glitter along the wings. My butterfly image was cut out and then I adhered it using glue dots. I did this so that the wings could still raise up off of my card just a bit. Other than that my card was fairly quick and easy. My black card stock was punched using my Cornice Edge MS border punch and I added two rows of paper piercing just along the bottom of my card. I drew in the antenna using my black SU marker. Don't forget today is the last day to enter, by leaving a comment, for a chance to win 100 stamped images. You will find more information about my current blog giveaway here. Have a great rest of the day! WOW! What a beautiful butterfly. I'm glad your daughter asked you to take its picture. AND the card you created is delightfully gorgeous! Love the whiteness and how the butterfly is so bold. Awesome! I love when you get inspiration from random things like that. I swear it makes the best cards. Great job Patty! 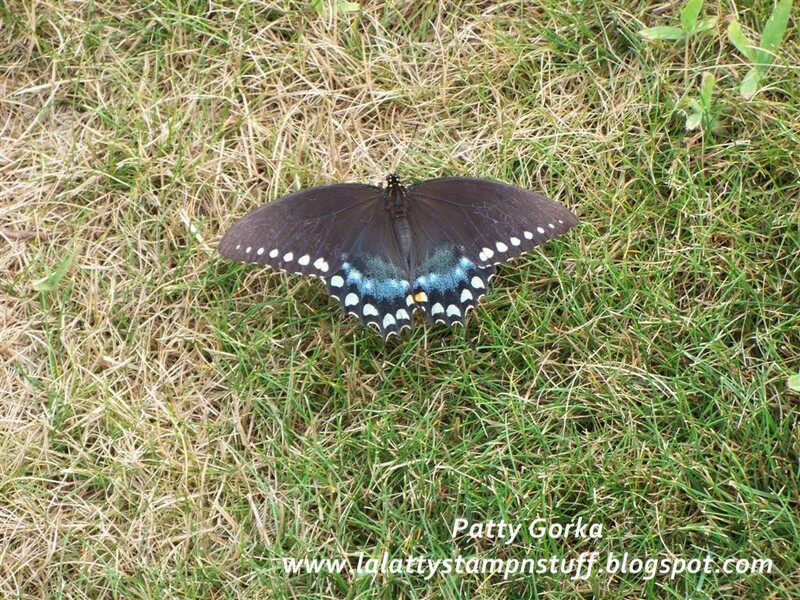 Wow Patty the butterfly in your yard is beautiful and the card you made is too! This is a beautiful way to complete the CAS challenge -- what a gorgeous card! 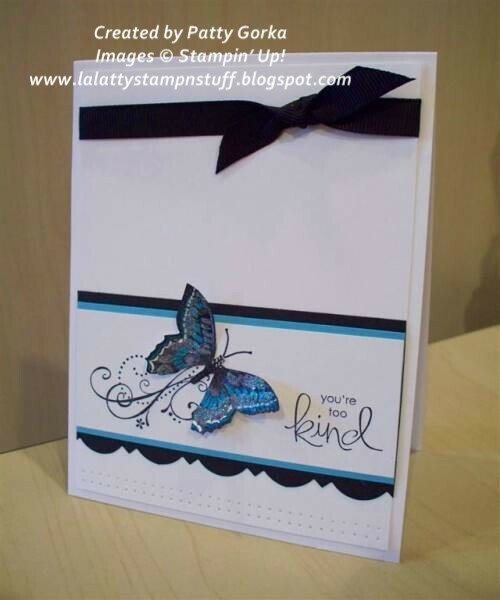 Such a pretty butterfly and the card it inspired is gorgeous!